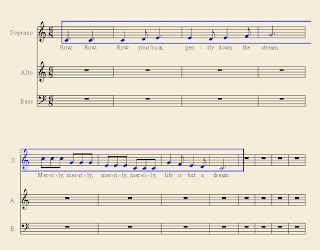 Copying and pasting, moving text down or up an octave, and hiding empty staves. Tip: While copying and pasting measures, it may be helpful to zoom out by selecting 75% or 50% next to the magnifying glass. Step 1. Create a new file from scratch. 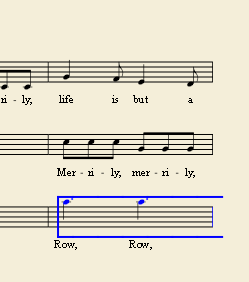 The title is “Row, Row, Row your Boat.” Enter “Traditional American Folk Song” in the composer line. Under vocals, select Soprano, Alto, and Bass. Keep the default key signature (C). Change the time signature to 6/8, and choose 16 measures. Step 2. Enter in the first eight measures on the soprano line. 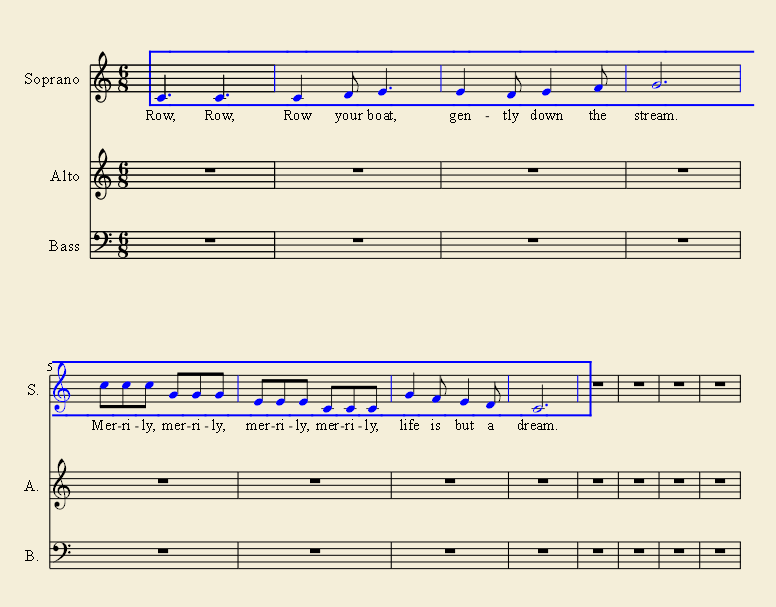 Exit note entry mode, click on the first note, and type “ctrl+L” to enter in the lyrics for those eight measures. Select the first eight measures. (Do this by double clicking on the first measure until it is surrounded by a blue box. Hold “shift” down and click on measure eight.) Now copy the measure by typing “ctrl+C” or with the mouse by clicking on “Edit” in the file menu and then selecting “copy”. Step 3. Now select measure three in the alto line. Paste by either typing “ctrl+V” or go to the file menu paste from the edit menu. Select measure 9 in the soprano staff and paste again. Step 4. Select measure 7 in the bass line and paste. Note that it enters the notes in the same register as the women’s part. While the measures are still selected, type “ctrl+down”. It will make the whole selection drop an octave. Step 5. Finishing the alto and bass lines. You can copy the first four measures and paste it into measures 11-14. If you don’t copy the measures isolated, it will paste the whole eight measures in, and add measures into your score. After you have pasted in measures 11-14 in the alto line, manually add the last two measures in the alto and bass lines and add text as shown in the assignment. You’re done! Remember that you can change the page settings under “Layout” to be letter size instead of A4. I always do this because I live in the States, and we print on letter sized paper. This is a fun one to listen to. I haven’t formally told you how to do this. The playback buttons are located under “Help” in the file menu. The third button will make you playback from the beginning of the piece. The fourth button is the play button, and it will play from where you are working, or from the beginning as applicable. The fifth button will turn on and off any repeats (and similar symbols like codas, etc) that you have entered into the score. Just want to leave a note to this section for copying and pasting. Please note: if you copy and paste a section that includes a whole measure of rest, be aware that the end result will cause the whole measure rest to have an off-centered whole rest, or for cases in 6/8 it will turn into a dotted half rest. Thank you so much for your feedback. Good to know!